So for this month's Random Recipe Challenge the theme was to pick out the first cookbook we'd used for the challenge. For me, this was the hefty (and now dog-eared) Great British Classics by Gary Rhodes. I don't use this book enough. I've never had a Gary recipe go pear-shaped, and there are all sorts of classics in there like steak and kidney pudding, fancy chocolate puddings and also a cracking Simnel Cake. What I saw though, as I opened the pages at a random point, was a recipe for a custard tart. This was good. I love them, all wobbly and yellow and dusted with nutmeg. But making them isn't, for me, without its mishaps. I normally dribble some of the custard mixture onto the oven floor when I'm filling it, the pastry doesn't go quite right, or I get lumps of scrambled eggy stuff inside. But with this, everything went really well. OK, some of the custard sloshed onto the oven floor as I topped up the tart case, but I just cleaned it up afterwards. But the pastry was crumbly and not at all soggy, and the custard set beautifully. And for anyone a bit iffy about making custard tarts, it is actually really easy. You just whisk egg yolks with sugar and then slowly pour on boiling cream, whisking all the while. Then you sieve it, and pour into a cooked pastry case. That then goes into the oven for about 30 minutes. You also have to follow Gary's advice on serving it. I'd always eaten custard tarts straight from the bakery fridge. But you have to enjoy them at room temperature to get the best flavour and texture. It's amazing how different this tastes when it's warmed up a little bit on the kitchen worktop. And I have to say, my wobbly yellow home made custard tart seemed to have so much more flavour than the pale, rubbery ones I've eaten before. A Random Recipe success! 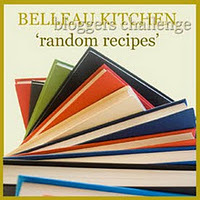 If you want to take part in Dom's Random Recipe Challenge, visit the Belleau Kitchen blog. This looks delicious! I do love a good Egg Custard Tart. Custard tarts are a great classic - this looks so good. Totally agree about serving at room temperature. Deeee-licious! What a lovely, lovely entry! I haven't really made use of any of Gary's recipes before thank you very much for the recommendation! Oh that is VERY impressive. Looks perfect and wonderful. What a beautiful looking pie. I love custard tart and must make it soon. I found your blog via the random recipe challenge at Dom's. Thanks Michael, glad you came by to have a look! I don't think I've ever made one but this post has encouraged me to have a go...thanks for sharing. Hi Deb, it's much easier than it looks to make, and I'm going to make it again soon. Good luck! I remember the disaster I had trying to make lemon curd tart for my first RR, the custard/curd wouldn't set! Funny how you should be doing a custard tart for your second RR, I'm ashamed to see sharp clean angles you can only slice from a tart done perfectly! I've heard great things about this book, it consistently gets good reviews - what a great book to get for the challenge! Custard Tart is my father-in-law's favourite dessert so I'll give this a go next time I need to impress him. That looks perfect, and you've cut it so cleanly! My slices always look like I've cut them with a blunt spoon. Yum! I've also come over from Dom's round up - I've never dared make custard tart, but you've encouraged me to have a go as I do love eating them!